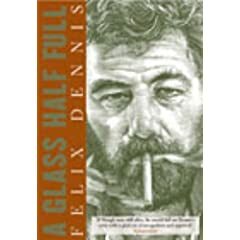 The edition I cite is one edited for an American release (Felix Dennis is an English poet), and if you base Americans need something else to hook you into this book, Felix Dennis is also known as the editor of Maxim…and yes, like his magazine, so too does his book have pictures. Of course the pictures in the book (literal and figurative) are not of flesh, but of soul. From solemnly meditative to outrageously comical, his poems covers topics from the banal to the transcendent, sometimes respectively…always eloquently. And everyone’s suing the handle. – here we are today. Whose turn it was to die. Do midges boast of heroes? Are some born lame or halt? To reckon blame or fault? Do midges mourn their fellows? Or do they die like men? To supply a post-post preface, I’m horrible at picking out which poems might/might not appeal to people or even choosing poems that might represent the use of the best devices of a poet’s tool-chest. Those poems I’ve posted above are sort, poignant, and humourous/contemplative. They are well-architected in that they are concise, with wording as intricate and laboured upon as the images they create. All of this work, without making the reading of it labourious. This is much the way the entirety of his book proceeds. And reminiscent of footnotes of old, most poems come with explanations of terminology or places or people. However, a modern twist to these footnotes are the conversational tone with the reader in which the author describes inspirations for poems, characters of poems, etc. This is what endeared me to his works as a whole, the fact that the works are so finely crafted, yet so personal to be open on a level where diary readers are welcomed into his original intent. This is evident in the acrostic poem, “Ed” (p.130), which is a simple, emotionally charged epitaph pertaining to a friend’s loss. And as powerful as the poem itself is, I have to admit that reading the explanation below the poem, where Dennis starts to ramble a bit in his own mind – like forgetting your speaking into a tape recorder – mid speech, made me shed a tear. I’ll end on the only bitter note I can conjure, and which brings me back to something I said earlier: this is an American edition. It was “made with an American audience in mind.” It ends…with a 9/11 poem. And while I’ll not turn this into a rant about how 9/11 and all incidents thereto tied have been cheapened by our current administration’s catch-phrase strategy, I will say way too many poets have written on the subject, badly, and worse…publicly. Felix Dennis is another on the pile so far as I’m concerned, but read it anyway. just read it first to get it out of the way so you can enjoy everything else this wonderful poet has to offer.